It was only three weeks after weâ€™d booked the tickets that Thailand decides itâ€™s time to start messing up our plans. I had thought that it was a stable enough place, and didnâ€™t even bother researching the political situation in the country. However, itâ€™s fairly easy to find out the events that precipitated the coup. The main story on BBC and other places is that people are annoyed at that Prime Minister Thaksin Shinawatraâ€™s handling of the sale of his multi-billion telecoms business to Singaporean investors, and his avoidance of tax. This ended up in the (then) PMâ€™s rushed general election in April; the opposition didnâ€™t bother to register and so it was a worthless victory. However, if you read a little further into things it seems that there is another element/undercurrent to the story. 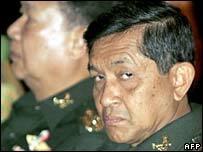 Gen Sonthi Boonyaratglin (pictured, looking like heâ€™s just been woken up), the supreme commander of the armed forces, is a Muslim. Heâ€™s the first Muslim in charge of the Thai army. There have been events in various southern parts of the country (Pattani, Yala, Narathiwat and Songkhla) that the FCO call civil unrest and insurgency; 1,400 people have been killed in these areas in the last 2 1/2 years. These are predominantly Muslim areas in what is a mainly a Buddhist country. The appointment of the General was meant to try and appease the Muslim minority in these areas and help the civil unrest. Now heâ€™s staging a coup dâ€™etat. Makes you think. Anyway, I hope that things are cleared up. A country that relies as much on its tourism as much as its textile and rice exports, isnâ€™t going to want to dry up its stream of visitors.